To explore the wonder and magic of Sri Lanka, be the first to witness the most sacred and magnificent event of the Year, that is held annually during July and August month in Sri Lanka. A historical event that has captured all visitors to beautiful procession that is filled with dancers, drummers, illuminated and robed elephant carrying the golden casket which is called the Ransivige sheltered with a canopy. Don’t miss the chance of seeing this radiant and extravagant procession while still enjoying the magic of Sri Lanka has to offer. After your arrival to the island, we will take you directly to the Club Hotel Dolphin Marawila, which is set upon the golden sandy beach, stretching across. As you will be spending your first nights in Sri Lanka, on the wonderful beaches, enjoying the full extent of what it has to offer, as you retreat yourself to relaxing by the turquoise seas and enjoying your leisure time at the hotel. After enjoying your breakfast at the hotel, we leave and head for Pinnawala. Get a chance to visit during the feeding time, at the Pinnawela Elephant Orphanage, which is about 2 hours drive from the hotel, it’s a home for the orphaned elephants. Be marveled by these magnificent creatures. Next we will take you to visit the beautiful Royal Botanical Gardens, which is another 1 hour drive from Pinnawela. To explore the more wonders of the Sri Lanka, we take you on a city tour of the magnificent Kandy. It is the second largest city and lies midst the hills of the Kandy Plateau, crossing an area of tropical plantation, mainly tea. Later on in the late afternoon, you will get a chance to visit the Temple of the Tooth Relic which is located in the royal place complex housing the Relic of the Tooth of Lord Buddha. This is yet another UNESCO world heritage site, and during your visit witnesses the extravagant cultural dance show. 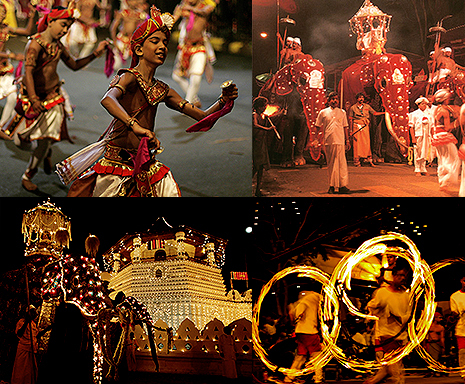 Sri Lanka is known as the land of festivals and traditions, and during every August , the sacred tooth relic of Lord Buddha, in a golden casket is taken in a traditional procession, on the back of magnificent temple elephants on the streets of Kandy for everyone to see and marvel at this most historical event, Kandy Esala Perahera. In the morning, we take you on a leisurely scenic drive to the hill country Nuwara Eliya, while stopping along the way for you to take some breathtaking views of the landscape and hills covering the area. Enroute you will get a chance to visit the tea plantation, and enjoy a tour of the hill resort of Nuwara Eliya. For your next destination, we leave early to arrive at Yala, The best known attractions for Yala is the elephants and the magnificent leopards, mostly seen in small and large herds. You will also get a chance to marvel at the herds of the spotted deer as you take a tour of the park. Witness the Monkeys the pinkish rhesus and the grey faced Langur monkey who lives and play on top of the tree as well as the ground. A surprise you could have is to see the Wild buffalo and wild boar in their natural habitat and be able to sight a leopard that would make your experience of the wildlife of Sri Lanka more memorable. As you leave behind Yala, we take you on a three hour relaxing ride to another hidden gem of Sri Lanka, Mathugama. All you can do is just enjoy the view and the great atmosphere of the ways of the Sri Lankan culture and lifestyle. On your final day on the beautiful Island of Sri Lanka, we take you back to the main capital Colombo, known as the commercial capital of Sri Lanka. Visit the Independence Square which has become a major tourist attraction due its historical significance and extraordinary work on its architecture. Also you will get a chance to visit the Old Parliament and enjoy a leisurely walk at the Galle Face Green facing the vibrant Indian Ocean. As we take you on a tour of this capital, you can take some for shopping at some of the famous department stores and malls in Colombo, where you might find Marks and Spencer, Victoria’s Secret, GAP and much more. You will also be able to gather some handmade crafts for your friends to take back. You leave with wonderful memories of a trip to the beautiful Island of Sri Lanka. Accommodation in hotels specified in the itinerary or in hotels of a similar standard. Air conditioned transport with services of an English speaking chauffeur guide.